Milos Forman apparently made a basic decision very early in his production of E.L. Doctorow's best-selling novel, Ragtime. He decided to set aside the book's kaleidoscopic jumble of people, places, and things, and concentrate on just one of the several narrative threads. Instead of telling dozens of stories, his film is mostly concerned with the story of Coalhouse Walker, Jr., a black piano player who insists that justice be done after he is insulted by some yahoo volunteer firemen. Doctorow's novel was an inspired juggling act involving both actual and fictional characters, who sometimes met in imaginary scenes of good wit and imagery. The Coalhouse story was more or less equal with several others. A film faithful to the book would have had people walking in and out of each other's lives in an astonishing series of coincidences. That might have been a good film, too. It might have looked a little like Robert Altman's “Nashville” or “Buffalo Bill,” and indeed Altman was the first filmmaker signed to direct “Ragtime.” But we will never see what Altman might have done, and Forman decided to do something different. He traces the ways in which Coalhouse Walker enters and affects the lives of an upstate New York family in the first decade of the century. The family lives in White Plains, New York, in a vast and airy old frame manor, and it consists of Father, Mother, and Younger Brother, with walk-ons by a grandfather and a young son. For Younger Brother, the sirens of the big city call, in the form of an infatuation with the chorus girl Evelyn Nesbit (Elizabeth McGovern). That's before the saga of Coalhouse Walker alters his life. Coalhouse (in a superb performance by Howard E. Rollins, Jr.) meets the family by accident, or maybe by fate. A young black woman gives birth to Coalhouse's son, and then the family takes in both the woman and her son, hiring her as their maid. Coalhouse comes calling. He wants to marry the mother of his child. He has earned enough money. Everything's all set for the ceremony, when an event takes place that changes everything. The local volunteer firemen, enraged that a black man would own his own Model T, block the car's way in front of their station. They pile horse manure on the front seat. And Coalhouse, quite simply, cannot rest until he sees his car restored to him in its original condition. The story develops quickly into a confrontation. Coalhouse barricades himself into New York's J. Pierpont Morgan Library, and issues a set of demands. The library is surrounded by police and guardsmen, led by Police Commissioner Rhinelander Waldo (the great James Cagney, out of retirement). Father (James Olson) gets drawn into negotiations, and Younger Brother (Brad Dourif) is actually one of Coalhouse's lieutenants, in blackface disguise. Meanwhile, Mother is running off with a bearded immigrant who started out making cutout silhouettes on the streets and is now one of the first film directors. The story of “Ragtime,” then, is essentially the story of Coalhouse Walker, Jr. Forman, a Czechoslovakian with an unusually keen eye for American societyÑhis credits include “One Flew Over the Cuckoo’s Nest” and “Hair!”, has made a film about black pride and rage and, not only white racism, which we sort of expect, but also white liberalism. The great achievement of “Ragtime” is in its performances, especially Howard E. Rollins, Jr. and the changes he goes through in this story, from youthful romantic love to an impassioned cry "Lord, why did you fill me with such rage?" Olson, quiet and self-effacing, is subtly powerful as Father. Mary Steenburgen is clear-voiced, primly ethical Mother who springs a big surprise on everyone. Pat O'Brien has two great scenes as a corrupt, world-weary lawyer. Kenneth McMillan blusters and threatens as the racist fire chief. And when Cagney tells him "people tell me É you're slime," there is the resonance of movie legend in his voice. 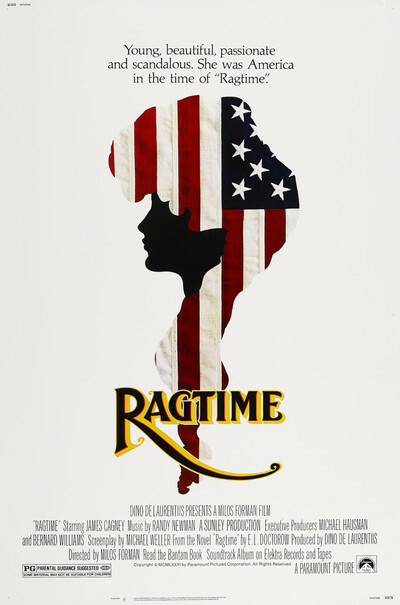 “Ragtime” is a loving, beautifully mounted, graceful film that creates its characters with great clarity. We understand where everyone stands, and most of the time we even know why. Forman surrounds them with some of the other characters from the Doctorow novel (including Harry Houdini, Teddy Roosevelt, and Norman Mailer as the architect Sanford White), but in the film they're just atmosphere, window dressing. Forman's decision to stick with the story of Coalhouse is vindicated, because he tells it so well.